Bronchiectasis is a respiratory disease that basically makes it difficult to clear the mucous from your lungs due to damaged airways, and is a disease that you should definitely be familiar with as a Respiratory Therapist. That is why we put together this study guide that is loaded with helpful bronchiectasis practice questions that can help you get a better understanding of the disease and ace your exams when that time comes. So are you ready to dive in? 1. What is the definition of bronchiectasis? Bronchiectasis is a chronic disease of the bronchi and bronchioles characterized by abnormal dilation, inflammation, and destruction of their walls. It is an irreversible lung disease seen in older adults that causes a chronic cough and recurrent lung infections. Lungs in this condition usually have an excess of puss and mucus. The bronchi and bronchioles will have permanent dilatation and thinning of airways. It retains inflammatory secretions and microbes that damage the airway and recurrent infection. Airway wall degradation is seen. 2. What are the causes of the bronchiectasis? There is no known cause. It starts in childhood in many cases and, often, a secondary to other diseases like ciliary dyskinesia (Karatenger’s syndrome), AIDS, bronchial obstruction, aspiration, aspergillosis, cystic fibrosis, tuberculosis, smoke inhalation, rheumatoid, transplant rejection, and pertussis. 3. What is the pathophysiology of bronchiectasis? The bacterial infection usually affects the segmental and sub-segmental bronchi. 4. What are the shapes of the destroyed bronchial walls? Varicose, fusiform, saccular, cystic and cylindrical. 5. Why are distal areas obstructed? It is due to secretions, inflammation and fibrosis. 6. What are some signs, symptoms, and observations of bronchiectasis? A continuous cough with a large amount of sputum, recurrent local pneumonia, occasional hemoptysis, and increasing dyspnea. 7. What is the breath sounds associated with a severe state of bronchiectasis? 8. What is the old method to diagnose bronchiectasis? 9. What is the latest method used to diagnose bronchiectasis? 10. What happens in the lungs of patients suffering from bronchiectasis? Bronchial walls are destroyed, mucosa atrophied and cilia destroyed. The elastic area is filled with pus. Distal areas become obstructed. 11. What are some problems associated with bronchiectasis? Clubbing, atelectasis, consolidation, increased thickness of the A-C membrane, bronchospasm, and excessive bronchial secretions. 12. How does the pulmonary function test of a patient with bronchiectasis show? It can show obstructive patterns. Remember “CBABE”. Bronchiectasis is a part of CBABE. 13. What does the ABG show on a patient with mild to moderate bronchiectasis? The ABG will show respiratory alkalosis with hypoxemia. 14. What does the ABG show on a patient with severe bronchiectasis? It will show compensated respiratory acidosis with hypoxemia. 15. What are some common infections associated with bronchiectasis? Haemophilus influenzae, streptococcus, staphylococcus, pneumonia, moraxella catarrhalis, and pseudomonas in cystic fibrosis patients. 16. What are some available management and treatment of bronchiectasis? Removing secretions and patients’ infections, P&PD, bronchial hygiene, mucomyst, bronchodilators, antibiotics, oxygen, and surgical removal. 17. What is the prognosis of bronchiectasis? The prognosis is extremely variable and depends on the extent of the damage. Good management is very important. 18. What will be the result of a high power bronchiectasis histology slide? The airway wall will be full of neutrophils and there will be puss in the lumen that is mostly neutrophils too. 19. What ethnicity does bronchiectasis common in? Bronchiectasis is more common in Asians and Pacific Islanders, and less common in African Americans. 20. What age does bronchiectasis more common in older patients? Bronchiectasis is more common among people ages 50-70s. 21. Who is most likely to have this disease? Bronchiectasis is more common in women. 22. What is the etiology of bronchiectasis? Most of the bronchiectasis disease is 50% idiopathic, 25% is a post-infection condition; another 15% is caused by systemic diseases. Many people with cystic fibrosis end up with bronchiectasis, but this is a small portion of the total population. This disease is not always clear in >60% of cases. It can be acquired or congenital which is approximately 50% of cases of cystic fibrosis and 20% from Kartagener’s Syndrome. It can also be due to past medical history of recurrent pulmonary infections. Patients with this condition present shortness of breath and possibly manifest pursed-lips breathing. The cough will be productive with purulent foul smelling sputum, hemoptysis, and three-layered sputum, and may be blood streaked. Patients with bronchiectasis will have a barrel chest and increased anteroposterior diameter. The respiratory pattern is accessory muscle use that shows signs of fatigue and abdominal breathing, cyanotic in color and clubbing of the nail beds. The diagnostic chest percussion is hyper-resonant and tympanic note. Breath sounds are wheezing and diminished. The chest x-ray shows hyper lucent lung fields, depressed or flattened diaphragms, and an enlarged or elongated heart. 23. What other lung condition is bronchiectasis often misdiagnosed as? Asthma, chronic obstructive pulmonary disease, and chronic cough. 24. How do you diagnose bronchiectasis? CT scan and a history of a chronic cough with sputum. 25. How does cystic fibrosis cause bronchiectasis? Cystic fibrosis has a defective gene called cystic fibrosis transmembrane conductance regulator, that causes thick sticky mucous which clogs the lungs leading to recurrent infections and damage to airways. The CFTR defect can be found at chromosome 7q31. Cystic fibrosis has allelic heterogeneity. 26. What is the laboratory results of hemoglobin and hematocrit for patients with bronchiectasis? The results will show increased values. 27. The alpha 1 antitrypsin deficiency can lead to focal bronchiectasis. How will the left lung pocket looks like after a patient with alpha 1 antitrypsin deficiency 1 and 2 undergoes a CT scan? The left lung’s pocket will show an abnormally large bronchi branch. 28. Tuberculosis causes bronchiectasis as it damages the airways. How will the CT scan look like for a patient post-tuberculosis bronchiectasis? The lower left lung will show evidence of a very local damage. It is important to note that it is just a coincidence that all of these occurrences happen in the lower left lung. 29. What is a primary ciliary dyskinesia? Primary ciliary dyskinesia is an autosomal recessive disorder. The cilia, the tiny hair-like structures that line the airways, in the primary ciliary dyskinesia are defective. This defect causes the bacteria to develop in the lungs and leads to recurrent infections and other disorders. 30. What are the complications of primary ciliary dyskinesia? Neonatal respiratory distress, daily wet cough from birth, chronic airway disease with age-dependent bronchiectasis, recurrent otitis media and reduced fertility. 31. What are the clinical signs of bronchiectasis? Audible secretions, severe sputum, finger clubbing, crackles, wheezes and skeletal abnormalities (tall, thin, pectus scoliosis), coarse inspiratory crackles over infected areas usually bi-basal and low body habits due to high energy demands. Situs inversus, a condition wherein all of the major chest organs are flipped like heart positioned on the right, cyanosis and cor pulmonale, an abnormal enlargement of the right side of the heart. 32. What are the clinical symptoms associated with bronchiectasis? The symptoms include neonatal respiratory problems, recurrent otitis media, recurrent sinusitis, recurrent pancreatitis, gastrointestinal disease, infertility in men and finger clubbing. In addition, patients will have recurring cough with lots of infected sputum, intermittent hemoptysis, persistent halitosis or bad breath, dyspnea and recurrent febrile episodes commonly called as pneumonia. 33. How do you treat chronic bronchiectasis with Pseudomonas? 34. How do you treat bronchiectasis? There is no cure for this disease. Treatment and management of the symptoms of this disease are very important. Available management for bronchiectasis includes airway clearance, targeted antibiotics, airway hydration, bronchodilators, macrolides, and surgery to fix and contain the localized disease. 35. Why does airway clearance important in bronchiectasis treatment and management? Airway clearance improves quality of life drastically and decreases the risk of infections. 36. What are macrolides in treating bronchiectasis? Macrolides are helpful in bronchiectasis because they are both anti-inflammatory and anti-microbial. Macrolides reduce bronchiectasis exacerbations, improve quality of life, and decrease inflammation. Macrolides = 50s inhibitors = azithromycin and erythromycin. 37. When do you use IV antibiotics in bronchiectasis? Use IV antibiotics during a bronchiectasis exacerbation, where symptoms are worse and a person is clearly infected. In cases of hemoptysis, starting IV antibiotics is a must. 38. What are the ABG results for patients with bronchiectasis? For mild to moderate cases, it shows acute alveolar hyperventilation with hypoxemia. In severe cases, the result will show chronic ventilatory failure with hypoxemia. 39. What will the spirometry results show for patients with bronchiectasis? Decreased Flow Rates (FEV1, FEV1/FVC, FEF25-75). 40. What will show on the CBC for patients with bronchiectasis? 41. What observation is seen in the sputum of bronchiectasis patients? It may indicate that an infection is present. 42. What will be the result of the special diagnostic tests of patients with bronchiectasis? On CT scan, an increased bronchial wall opacity with a characteristic appearance of end-on signet ring opacity. 43. What will chronic dilation of the airways in bronchiectasis patients lead to? It leads to chronic infection and inflammation. 44. What is the difference between other chronic obstructive pulmonary diseases to bronchiectasis? Some COPD diseases do not manifest clubbing, whereas, in bronchiectasis, clubbing is common. Sputum in COPD is not of the same quantity as with bronchiectasis. 45. What is the risk factors of bronchiectasis? The risk factor is an idiopathic bronchiectasis. Other disorders can interfere with bronchial secretions like post infection from tuberculosis, pneumonia, peruses, cystic fibrosis, bronchial obstructions such as tumor and/or foreign bodies; ciliary dyskinesis syndromes as in Kartageners and young syndrome; immune deficiency specifically IgA deficiency; and connective tissue disease which is 1/3 of rheumatoid arthritis. 46. What is the pathology of bronchiectasis? Pathology includes any bronchi involved most commonly lung bases. Airways dilate, purulent secretion, chronic inflammation in the wall with inflammatory granulation tissue and exacerbations leading to scarring that results in respiratory failure. 47. What four main organisms present in patients with bronchiectasis that is isolated? These are haemophilus influenza, streptococcus pneumoniae, staphylococcus aureus and pseudomonas aeruginosa. 48. What are the five main causes of bronchiectasis? It is idiopathic, congenital, post-infectious, immunodeficiency and other causes. 49. What percentage of bronchiectasis is a result of idiopathic causes? 50. What are four congenital causes of bronchiectasis? Cystic fibrosis, primary ciliary dyskinesia, Kartagener’s syndrome and Young’s syndrome. 51. What are five post-infectious causes of bronchiectasis? Measles, pertussis, pneumonia, tuberculosis and bronchiolitis. 52. What type of immunodeficiency is associated with bronchiectasis? 53. What are five other causes of bronchiectasis? Bronchial obstruction (tumor, foreign body), allergic bronchopulmonary aspergillosis, rheumatoid arthritis, ulcerative colitis and yellow nail syndrome. 54. What is the typical history of a patient that presents with bronchiectasis? Usually, there is a history of chronic productive cough and recurrent chest infections. 55. What are the main symptoms associated with bronchiectasis? A persistent cough with purulent sputum, hemoptysis (may be massive), fever, and weight loss. 56. What are the main signs associated with bronchiectasis? Clubbing, coarse inspiratory crepitations, wheezes, and purulent sputum. 57. What are seven complications of bronchiectasis? Pneumonia, pleural effusion, pneumothorax, pulmonary hypertension, massive hemoptysis, cerebral abscess, and amyloidosis. 58. What investigations would you perform in a patient presenting with suspected bronchiectasis? Sputum: microscopy, culture and sensitivity; blood: serum Ig, aspergillus precipitins test, rheumatoid factor, α1-antitrypsin level, test Ig response to pneumococcal vaccine and spirometry: Obstructive pattern. 59. What tests are performed in patients with suspected bronchiectasis? Test will involve sputum, blood, spirometry, and chest x-ray, high-resolution CT of the chest, bronchoscopy and cystic fibrosis sweat test. 60. What specific blood tests are ordered in patients with bronchiectasis? Serum Ig, aspergillus precipitins test, rheumatoid factor, α1-antitrypsin level, assessment of Ig response to pneumococcal vaccine. 61. What pattern might spirometry show in a patient with bronchiectasis? 62. What is the characteristic of the chest X-ray appearance of bronchiectasis? Dilated bronchi with thickened walls (tramlines and rings) and multiple cysts containing fluid showing cystic bronchiectasis. 63. What test is the gold-standard for diagnosing bronchiectasis? HRCT of the chest is used for diagnosing bronchiectasis. HRCT shows cystic bronchiectasis. 64. Why would you conduct a bronchoscopy in patients with suspected bronchiectasis? To locate the site of hemoptysis, exclude obstruction, and obtain samples for culture. 65. How would you manage a patient with bronchiectasis? Patient management includes expectorants, early childhood immunization, lung resection, airway clearance techniques and mucolytics, and administration of antibiotics for indications of exacerbations. If ≥ 3 exacerbations/year, long-term antibiotics is necessary (may be nebulized). Patients who culture pseudomonas, oral ciprofloxacin or other suitable IV antibiotic should be given. Use of bronchodilators with nebulized B2-agonists (e.g. salbutamol) in asthmatics, corticosteroids: (e.g. prednisolone) and itraconazole for ABPA (allergic bronchopulmonary aspergillosis) and surgery for severe localized disease or severe haemoptysis. 66. What anatomic alterations are included in patients with bronchiectasis? 67. What are the key anatomic alterations of rigid and dilated bronchi? 68. What are the key anatomic alterations of irregularly dilated and constricted bronchi? 69. What is the greatest damaged tracheobronchial tree that can cause bronchiectasis? 70. What is the congenital cause of bronchiectasis? 71. What will be a possible condition of a child if parents don’t give the usual childhood immunizations and the child has been repeatedly hospitalized with pulmonary infections? 72. What should be done to prevent bronchiectasis from worsening? Avoid air pollution, get an influenza vaccination and avoid smoking. 73. What other conditions are associated with severe bronchiectasis? Cor pulmonale, distended neck veins, and polycythemia. 74. What will be the hematology test results of patients with bronchiectasis? It will show an elevated WBC count with increased hemoglobin and hematocrit. 75. What are the hallmark sypmtoms of bronchiectasis? A chronic cough with production of large quantities of foul-smelling sputum. 76. What is the usual characteristic of the sputum of patients with bronchiectasis? It is usually voluminous and tends to settle into several different layers. 77. What signs do patients with severe bronchiectasis may have? Distended neck veins, pitting edema, enlarged and tender liver. 78. What lobe of the lung is bronchiectasis frequently found in? 79. What part of the airway does bronchiectasis usually affect? 80. What type of organism makes the mucus very smelly? 81. What are the three forms of bronchiectasis? 82. What form of bronchiectasis has irregular dilations and constrictions and appear distorted and bulbous? 83. What is the other name for varicose bronchiectasis? 84. What form of bronchiectasis has a tube-like dilation, where they lose their natural taper for 6-20 generations and appear to end squarely? 85. What is the other name for cylindrical bronchiectasis? 86. How many generations or divisions of the airway are there? 87. What shape on a CT scan do bronchial walls may have? 88. What is the other name for cystic bronchiectasis? 89. What are two types of Bronchiectasis? 90. What are the two types of acquired bronchiectasis? Pulmonary infection and bronchial obstruction. 91. What is an acquired form of bronchiectasis that is in repeated and prolonged respiratory tract infections? If children have frequent bronchopneumonia from measles, chickenpox, pertussis, or flu, this may cause bronchiectasis later and pulmonary infection. 92. What is an acquired form of bronchiectasis that occurs by tumors, big lymph nodes, or aspirated foreign bodies? Mucus clearance is affected and can cause necrotizing bacterial infections resulting in bronchial obstruction. 93. What type of congenital bronchiectasis is dextrocardia and paranasal sinusitis? 94. What percentage of congenital bronchiectasis does Kartagener’s Syndrome make up? 95. What kind of disorder is caused by congenital bronchiectasis that includes rheumatoid issues, inflammatory bowel disease, and AIDS? 96. What kind of congenital bronchiectasis causes problems with mucus clearance and thick, stagnant secretions that leads to obstruction and frequent infections? 97. What is stimulated when the PO2 drops below 60 mmHg? 98. What happens to the fingers due to chronic hypoxemia? 99. What are the three potential bacteria in bronchiectasis sputum? Haemophilus influenzae, pseudomonas aeruginosa and anaerobic organisms. 100. What happens to the obstructive areas in tactile and vocal fremitus? It causes a decrease in tactile and vocal fremitus. 101. What happens to the restrictive areas cause in tactile and vocal fremitus? It causes an increase in tactile and vocal fremitus. 102. What type of disease is bronchiectasis? It is both obstructive and restrictive. 103. What kind of flows and volumes do the obstructive areas have? Decreased flows and increased volumes. 104. What type of flows and volumes do the restrictive areas have? Normal flows and decreased volumes. 105. What type of ventilator acid-base assessment does a mild to moderate bronchiectasis has? 106. What type of ventilatory acid-base assessment does a severe bronchiectasis have? 107. What is performed by injecting an opaque contrast material into the airway to show the extent of the bronchiectasis disease? Bronchogram. It is important to note that this method is not done very often anymore as it is very invasive. 108. What has been done in place of bronchograms? 109. What type of bronchiectasis has increased opacity (white) due to tissue density? 110. What type of bronchiectasis has translucent (dark) lung fields? So there you have it! That wraps up our study guide all about bronchiectasis. 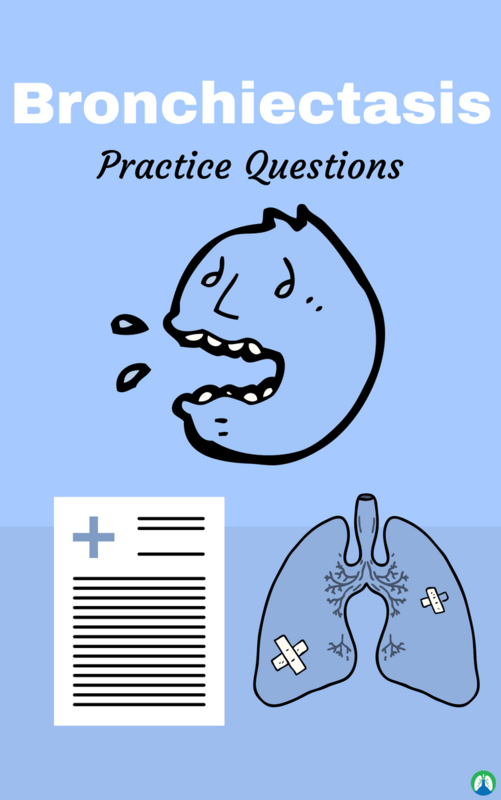 I hope these practice questions were helpful for you and I know that if use read through them a few times, you will definitely have a good knowledge and understanding of bronchiectasis. The best part is, this will help you treat these patients more effectively in the future once you start working as a Respiratory Therapist. Thank you for reading and I will see you in the next post. Breathe easy my friend!